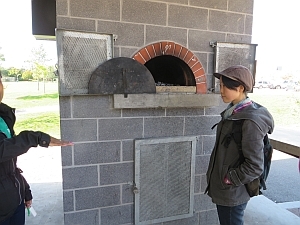 We visited for a show-and-tell with the community recreation programmer and one of the oven staff. They told us that the oven is mainly used during the summer months, usually 2-3 times a week, for summer camps. The kids roll out their own dough and put on toppings, the staff bake them. Kids are given hand sanitizer before they make the pizzas. Sometimes if there is a big crowd, the pizzas are taken to a room with tables inside, and handed out there. During the summer of 2015 the drop in fee for family pizza events was $3.50 and that covered the cost of ingredients and also of the staff. Camps pay a different price than the community drop ins because of City inter-branch payment procedures. (Not sure how much.) 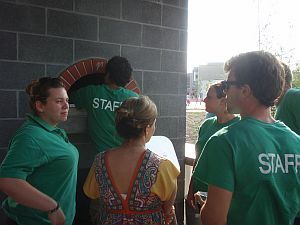 The staff can fit about 4 personal pizzas in the oven at one time, or two large ones. They try to have a big burn before the pizzas go in, and then no flames during pizza-making time -- but they say that the oven is so hot, the pizzas still get done within minutes. 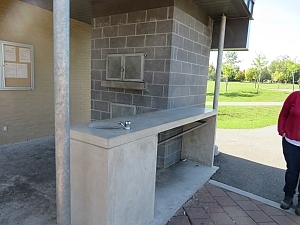 There is a single sink at the prep table. Staff said it was only hooked up to water this year. It looks like there are gaps between the hearth tiles, similar to the Regent Park oven, but here it's not an issue because the ashes are moved to the back with a broom rather than a rake. 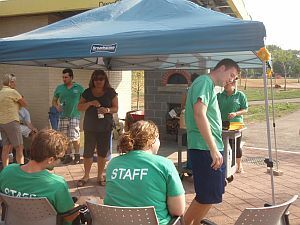 There are 6 part-time recreation staff trained to use the oven. Sometimes 2-3 can manager the oven for a program; with high attendance events there would be 5 staff at once. We asked about bakers getting sparks in the face because the hearth is at eye-level, but they said no one had even had that happen. The shorter staff use a stool so they can see the hearth better. Before the summer camps begin, the summer staff are sometimes brought together for pizza-making during their training days -- apparently this is a popular event. "how much is a councillor charged for a pizza oven event such as the movie night hosted by your councillor? Am I right it would be - the permit+insurance fee - plus materials cost - plus the cost of staff, i.e. in the case of a large turnout, five or six staff for the hours of the event plus prep and cleanup times?" "Yes that is what the Councillor would pay, unless it's a joint partnership event hosted by Edithvale CC and the Cnc Office." In a follow-up with Councillor Filion's office, we were told that indeed, all the movie nights are partnership events and so all that the councillor pays is the cost of flour, cheese, etc. (although these are often donated by a local merchant). Can you let me know what the yearly Edithvale oven-related food income has been since the oven was added?" "My other question was about the yearly oven-related income at Edithvale, since oven programming began there. That's because at this point, Edithvale may be the only other city-owned oven (besides Dufferin Grove) that has regular programming run by the city. 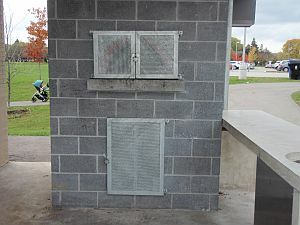 The city also owns ovens in Riverdale, Alexandra, Regent, Thorncliffe (R.V.Burgess) and Christie Pits parks, but those ovens either have minimal use or are programmed only by non-staff groups.....do you list the oven-related staff costs, firewood, materials, equipment costs, etc. separately from your regular SAP entries?" "the Bake Oven costs/revenues are inter-twined with other Edithvale programming. I'll need some time to extract the information; as soon as I do I will forward you the information." - cost for the bake oven program would be wood, flour, yeast, tomato sauce, cheese and any other toppings, corn meal for the peel. Food and beverages are GL 2750, plus maybe 2999 (misc.materials and supplies) for the wood? - cost for staffing would be the number of staff scheduled for the specific pizza days (presumably on your staff schedules or work calendar), and the number of hours they worked x their wage rate plus benefits. 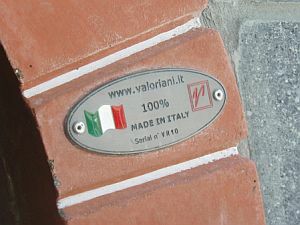 - extra costs would be any posters to advertise, paper napkins or plates and other incidentals. Maybe GL 2999 again? Your admin costs might also be included, i.e. the hours you spent setting up these days and supervising the actual program x your hourly wage rate plus benefits. Income would be listed under GL 8546 or 9605, or possibly 9415. I'm sure you have lots of other tasks taking up your time, but I hope it would take no more than an hour to go into your SAP/Class and get the numbers together. Please let me know if there's a further problem that I'm not understanding, that would take more than the three weeks that have already passed since I put my question to you (Oct.19). I do hope that the question of bake oven income versus cost is of interest to the City as well. About a week ago the staff called and said the finance person was still working on this question and was hoping to respond in about two weeks. 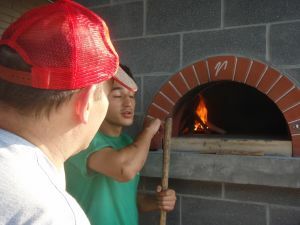 The staff say that the oven was used about three times a week in summer, for making pizza with visiting city summer camps. There were also two film nights in the summer, sponsored by the City Councillor, when pizza was made -- but both nights had rain, so the movies were shown inside and the staff brought the pizza in. 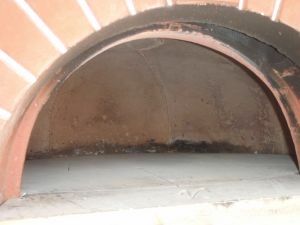 There were no permits, because this oven is not available without city staff. 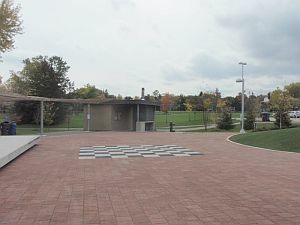 "We are moving ahead with our Outdoor Bake Oven & Movie Night at Edithvale Park this evening. 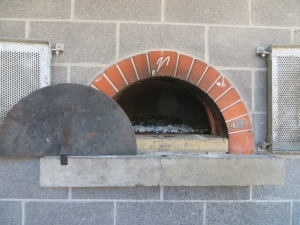 Though there may be a few sprinkles, our Edithvale Bake Oven Volunteers & City of Toronto PF&R staff are firing up the oven for some of the best wood fired pizza you’ve ever tasted. Serving starts at 7 PM." 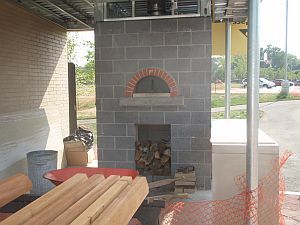 We got a look at the new Edithvale oven, almost finished. 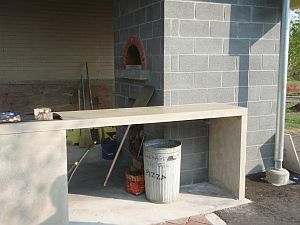 A nice marble table is fixed in beside the oven, giving a good work space. 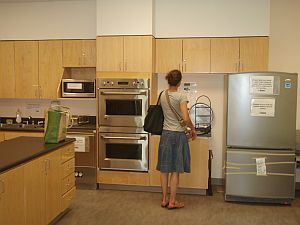 The oven itself is small (prefab) and high. "On Thursday, August 29, we return to Edithvale Park for a terrific evening of entertainment. At 7 PM, Willowdale native Jory Nash takes the outdoor stage for a live set in the park. The Edithvale Bake Oven Volunteers will be doing what they do best - making some of the freshest pizzas you will ever find at the outdoor bake oven. I invite you to come out and grab a slice. At about 8:45 PM , we will start a screening of "The Adventures of Tintin," Steven Spielberg's animated film based on the classic children's hero." Looks like the oven is closed for the season, although there's no sign about it on the adjacent bulletin board. 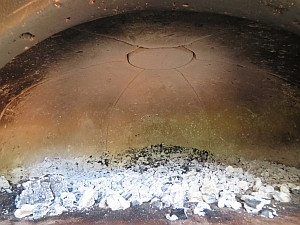 The oven looks very clean -- hopefully as it gets more use it will start showing the soot one sees on well-used ovens. Staff did say, though, that they used it a lot this past season.